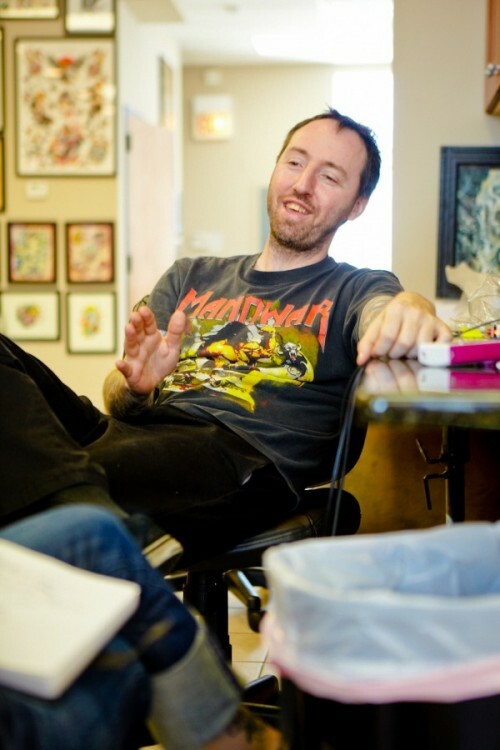 By Laura Roeper Courtesy of ChicagoNow.com: I had the wonderful experience of interviewing Ben Wahhh -he shared his knowledge and wit when we spoke at his shop, Deluxe Tattoo in Chicago... The juxtaposition of Ben the tattooist, and Ben the dad, were just too fun to just mention in writing so the video is in itself a piece of art, “The two lives of Ben Wahhh.” Enjoy! [vimeo http://www.vimeo.com/31170257 w=560&h=365] [Interview on expanded page] Laura Roeper: Ben, I do want to get some background information and a bit of personal history. Did you, as many of the artists I have spoken to, have any drawing interests as a kid, art classes? Ben Wahhh: I drew everyday as a kid, on napkins, place-mats and schoolbooks, which of course got me in trouble! As a teen I worked at a comic bookstore, and thought that was the direction for my art. I studied comic book art, very intent on making it my career. I had a friend, also interested in comics, who was older and actually interviewed with a major company. I was very disappointed when I heard how restrictive they are. They have specific color palettes they want you to use, you can’t make your figures too ethnic looking, they want you to draw like the most popular artist of the day, etc. So that was that for comic book art. I was enrolled in college to become an art teacher, but at UIC I again became disillusioned. They pad your degree with lots of classes that have absolutely zero to do with your field of interest. Most of my “teachers” simply lectured or left you to a student. Finally, I had a teacher that was teaching us outdated, wrong information, so I went to the Chancellor’s office to complain. They acknowledged that I was right, but when these people get their tenure there is nothing they could do about it. I got a refund and that was that. At this point I had a friend who was tattooing and had offered me an opportunity. Left directionless I accepted the offer. I had no clue what I was in for! LR: That leads us then into the start of your career, as you are not new to this industry, I think now it is about 18 years or so? BW: I started in about 1993 as an apprentice with Nick Wiggins in Champaign. I lived down there for 8 months. Nick had good intentions, but was not a very patient teacher. We parted ways and I came back to Chicago, resuming my job doing computer graphics and tattooing my friends on weekends, trying to build up a portfolio. I was at a friend’s apartment one day and Bob Oslon was at an apartment upstairs and heard me working, saw some of my tattoos and basically offered me a job at Custom Tattooing. Guy Aitchison, Dr. Dean, all worked there at the beginning of their careers. 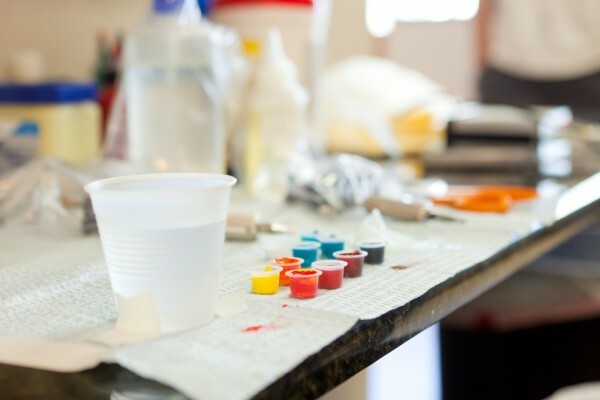 Bob had also been involved with the opening of the Tattoo Factory and helped the owner of Jade Dragon learn to tattoo. Bob basically showed up my first day, assured me he would be there and “Wouldn’t leave me to the wolves”, and disappeared. When I told my new co-workers what he said, they all laughed. He would show up once every two weeks to get his money. He was a life long drug addict, a real pity. He had a great heart, just very troubled. After a year or so he decided to make me the manager, which was awkward because I had the least tattoo experience, but was the most responsible. Along with his accountant, we tried to have interventions, but to no avail. We had to issue him an ultimatum, which he failed. At this point everyone who worked there were friends, so I asked them if I opened a shop if they would like to work there, and they did. Deluxe Tattoo was born. Managing and owning a business are more different than I could have known, but I rode the chaos and here we are today, 14 years later. LR: You are in a brand new, beautifully remodeled space, why now? BW: The space next door became available and it was newly remodeled. When I opened Deluxe originally it was 4 people. I had absolutely no idea that tattooing would become as huge as it has. So there we were with 9 people in a shop built for 4, expansion was in need and the timing was right. As someone who first got tattooed so long ago it was not legal in many states, I have witnessed the major expansion of the industry, some good and some bad. Always grateful that my friends are working yet we are aware of choices people make based on media, the ease of creation on TV that is not real-time, etc. This brings us to another point of view to get from you. I have talked to friends about this and we are wondering if the next generation will not want tattoos, as they can now say, "my uncle is covered, my Mom has a full chest piece" etc. Kids usually do not want what their folks have! The tattoo explosion still baffles me; I absolutely fear that it will all end tomorrow! It’s all media related. When the tattoo magazines came out it caused a tattoo renaissance, now the TV shows have caused another one. People who are into counter-culture art and music get jobs in big media and think they are going to rub the publics' face in punk rock tattoo heavy metal-ness, but it back fired. Who would have thought you would be hearing the Ramones in Dominick’s while shopping for groceries, or see Ozzy on a network TV series? It could be opposite and more extreme, facial work etc. LR: One last question, I really like to ask the tattoo artists what about off hours, though of course, with this type of work, there is not many to be had. Do you paint also? BW: No. I used to do more “Art” but just decided that the very best I will ever be is mediocre. This is the case with 99 percent of artists out there. The world does not need another average skull drawing. I still love doing tattoos and drawing for my customers. I play pool and do extreme number puzzles that would make your brain fall out of your ear. I also have little free time and use it to hang out with my wonderful wife, two-year-old daughter, three dogs and two turtles. Ben Wahhh can be found at Deluxe Tattoo in Chicago, IL.